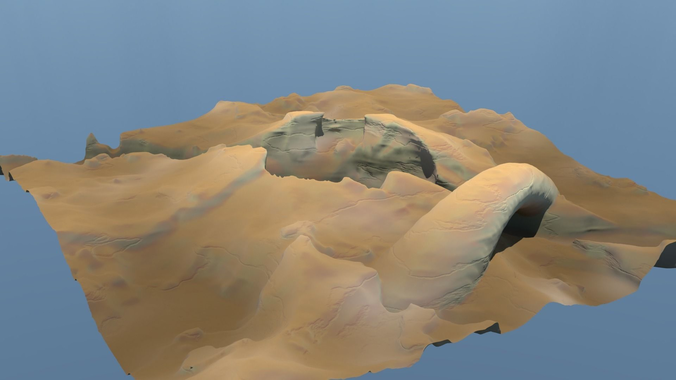 2km square landscape with a central crater/dormant volcano like feature. A large rock archway has formed spanning the central chasm The mesh is triagulated Supplied Textures (4kDiffuse and 4kNormal) are 4K - you just need to apply the diffuse one For very close shots the shadows can look too sharpe/harsh (image BL_3) so to soften it just apply Sub D to the mesh (BL_3 with sub D) The cinema 4D shots (Abyss_1 Abyss_2 Abyss_3) just use the 4kDiffuse texture in the Color, Bump and Displacement Material channels - they are the last 3 renders listed. The Blender file does not use the Experimental Displacement feature - I decided not to, to keep the renders fast.